Info. on first Success Series for Spring 2018! 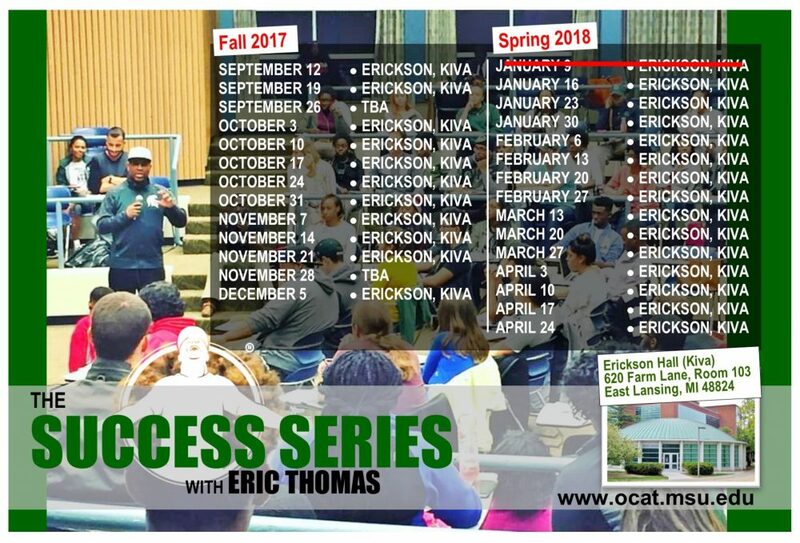 The Success Series is a motivational and support series for MSU students that features the dynamic one-of-a-kind motivational speaker Dr. Eric Thomas (aka the Hip-Hop Preacher). These sessions are every Tuesday (during MSU’s academic year) at 7:00PM and feature a powerful message by ET on topics such as “refocusing,” “who’s on my team?” “self-esteem,” and much much more! Each session also features a Q&A portion with ET. This is the BEST 60 mins of the week!!! This event is FREE & OPEN to the public. Email ocat@msu.edu or call (517) 353-7745 or (517) 353-9140 with questions.